A peanut breeding line with high-oleic acid and an isogenic sister line with normal fatty acid composition were obtained. Oil was extracted with dichloromethane and processed in the laboratory by alkali neutralization and bleaching. Fatty acid compositions were determined by gas chromatography and application of theoretical response factors. Oils were extracted and processed in duplicate. The oxidative stability of the oils was measured by the Schall oven test (80°C), active oxygen method (AOM) (112°C) and by comparison of oxidation rates on thin-layer chromatography-flame ionization detector (TLC-FID) rods (100°C). 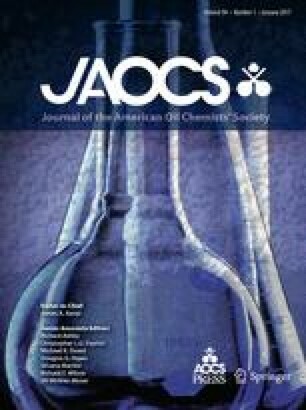 Fatty acid analysis indicated that the high-oleic line had 75.6 and 4.7% oleic and linoleic acids, respectively, compared to 56.1 and 24.2% for the normal line. The induction times for the Schall test were 682 and 47 h for high- and normal-oleic oils (P<0.01). The AOM induction times were 69 and 7.3 h for high and normal oils, respectively (P<0.01). The times to reach 50% loss in triglyceride area on TLC-FID were 847 and 247 min for high-oleic compared to normal-oleic oils (P<0.01). The results indicate that high-oleic peanut oil has much greater autoxidation stability as compared to normal oil.